Put the crackers in a plastic bag and crush to fine crumbs with a rolling pin. 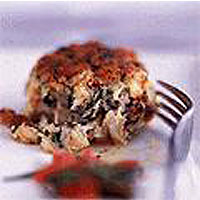 Put the crab meat into a bowl with the parsley and add just enough cracker crumbs to absorb any moisture from the crab. You may not need them all. Whisk the beaten egg with the mayonnaise, mustard, lemon juice, Worcestershire sauce and the seasoning. Fold this mix into the crab but don't break up the lumps of crab too much. Shape the mixture into 8 patties, put them on a plate, cover with clingfilm and chill for at least 1 hour. Heat the clarified butter in a large frying pan. Add the crab cakes (in batches if necessary) and cook over a medium heat for 3-4 minutes each side until crisp and golden. Keep the first lot warm, while you cook the second batch. Meanwhile, for the sauce, boil the vinegar in a small pan until reduced to about 2 tablespoons. Add the butter, tomato, tarragon and seasoning to taste and warm through. Serve the crab cakes immediately, with the sauce.